There once was a village by the sea that did not have a doctor; it had a seamstress. The seamstress’s grandparents came to the new world from Germany. Her grandmother was a dressmaker and her grandfather a milliner for the National Theater in Munich. They brought culture to the small port town where they opened their store. The grandmother made clothes for the fishermen’s wives and gave birth to a beautiful daughter. The grandfather was active in the establishment of the opera house that still stands to this day. The grandfather died of old age, after having seen many productions at the new opera house and marrying his daughter off to a sea captain. The daughter did not inherit the mother’s sewing skills, but she sang a beautiful mezzo-soprano. It was her voice that had called the captain to her; it was the sea that had called him back. The grandmother was the only survivor of these tragedies, and she took it upon herself to protect her granddaughter from the pain that her own daughter had suffered at the hands of young, lost love. When the child was five she asked her grandmother where her mother had gone when her father didn’t come back from the sea. “I wish I could have fixed mother’s heart,” the child lamented. The young seamstress learned to sew at her grandmother’s feet. She fixed hems and refastened buttons, but the work bored her. Each night, after her grandmother had fallen asleep early, she wandered the lonely lanes that all, inevitably, led to the seaside. There she watched the ships as they came and went, going about their business without her. One evening as she walked home, the seamstress found a bird with a broken wing fluttering dizzily around the road. The bird couldn’t quite make it off the ground. The seamstress called out for help, but at this time of day, families were at home and fishermen were off at the taverns. She had no skills to heal the wing, but she couldn’t bear to leave the bird without flight. She swooped the bird into her hands, held it firmly, and took out her sewing needle and a small patch of blue fabric, to match the feathers. 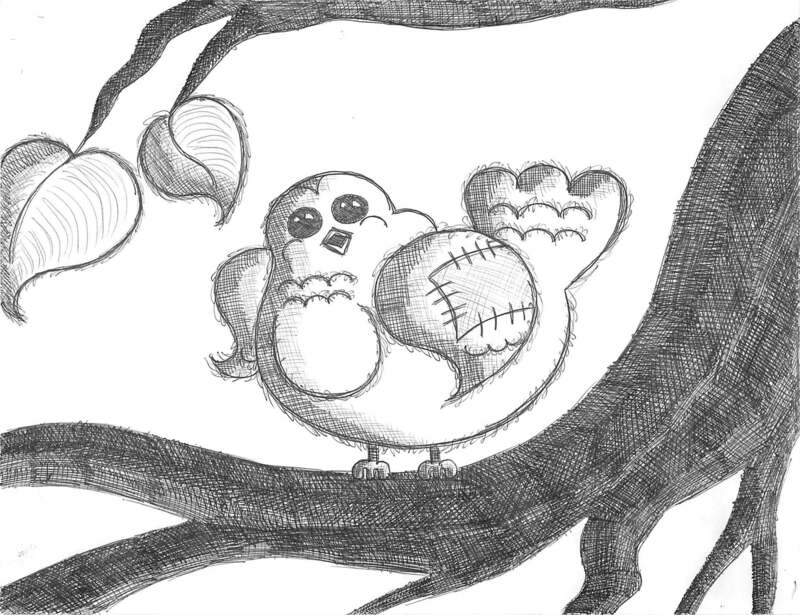 She sewed the patch over the wing and let go of the bird. It wobbled uncertainly on the ground, steadied itself, and flapped its wings. With a run and a jump, it took off. She smiled to herself and returned home, telling no one of what had happened. But, another pair of eyes, peering out the window of his home, saw what she had done with needle and thread and he told his family. They did not believe his story so he set out the next day to the dress shop in search of further proof of the seamstress’s abilities. The grandmother moved slowly out of her chair, curious of all the whispers between her granddaughter and the strange man. The seamstress spent the afternoon sorting through swatches of cloth to match the right hue with the man’s skin tone. When he appeared that evening, they sat down in the front of the store and she pulled out her tools. “I’ll warn you now, this may hurt a bit,” she said as she drove the needle through the cloth and into his skin. It took her only ten minutes to finish sewing and cut the end of the thread, and when they both looked down at his leg, they saw a perfectly rectangular patch where his cut had once been. The man wiggled his leg a bit, stretched it out, and then stood up. He took the first few steps slowly, and then he broke into a light jog around the room. “You’ve done it! You fixed me,” he said. He thanked her and paid her generously for her time. The man ran all the way home, so fast that his family thought he must have been faking his limp in the previous days to get out of his chores around the house. When word spread of the seamstress’s skills, most of the businesses were boarded up and the trade people moved away. The seamstress fixed broken toys, the roofs of houses, carriage wheels, sick dogs, and occasionally a dress or two, until the small seaside village started to resemble a patchwork quilt. 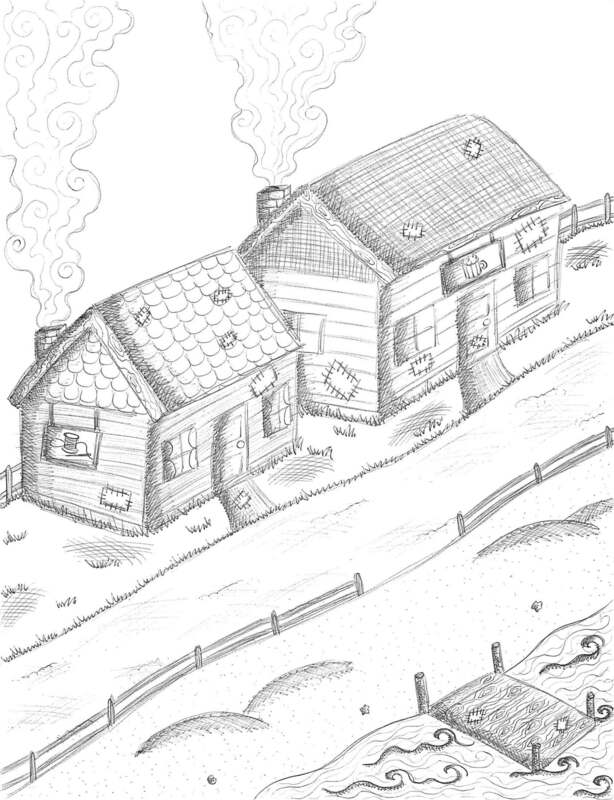 The town was left mostly to the seamstress, her grandmother, and the sailors and fisherman. Their business remained intact because, after all, there was not a patch big enough to cover the ocean. The work exhausted the young woman and her only solace was her evening walk along the shore. Everyone in town, it seemed, wanted her to fix something. She worried that they expected too much of her. On an April evening, the warmest yet, the seamstress escaped her busy shop and walked to the docks. Most of the fisherman didn’t know her and she felt grateful for the solitude. As she wandered between the great ships, she stopped when she saw a hole near the top of the port side of a small fishing boat. 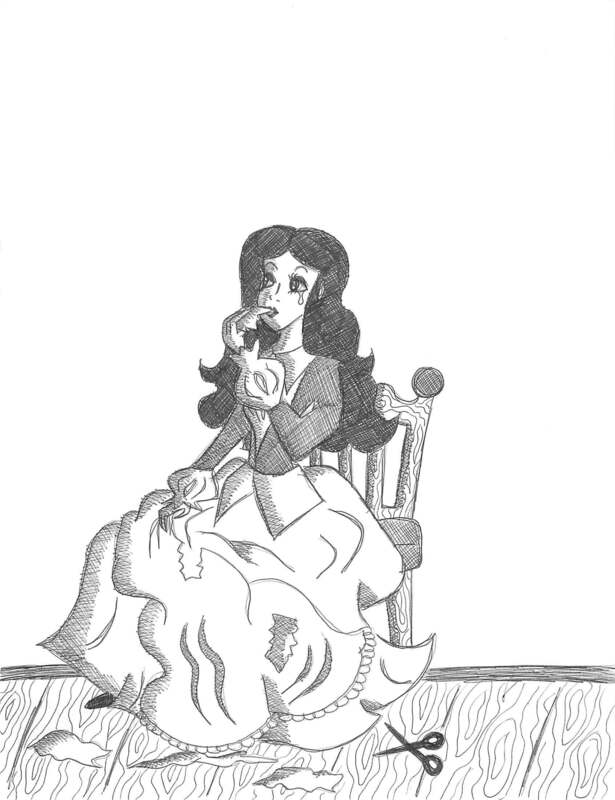 She searched through the pocket of her dress and found amongst the small scraps of fabric, a brown just close enough in color to the wood of the boat. She stood on her tiptoes and pierced the wood with her needle. It wasn’t until after she had finished patching the boat that she saw the young man standing behind her and watching her every move. “What do you think you’re doing to my fishing boat?” He demanded. “Well, I don’t know if that’s true,” she blushed. “I hope it does, sir,” she said and curtsied. “Me too, ma’am,” he said with a tip of his hat. 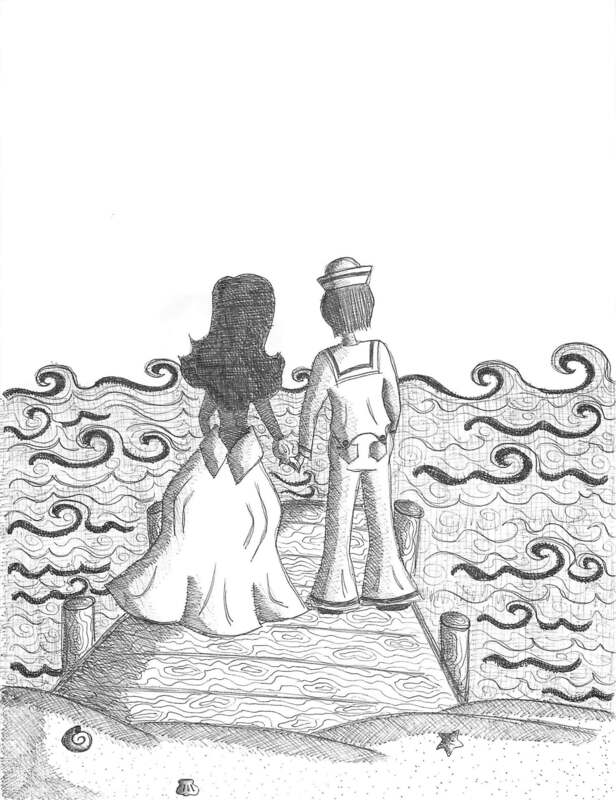 When she had left the dock, he reached up and ran his hand across the patch. He didn’t think a simple piece of cloth could withstand the sea, but he wanted it to. A woman like that was sturdy and would make a wonderful fisherman’s wife. Besides, she had the face of a new bloom. The next morning, when the fisherman docked, the patch remained in its place, and he ran all the way to the seamstress’s shop to ask for her hand in marriage. 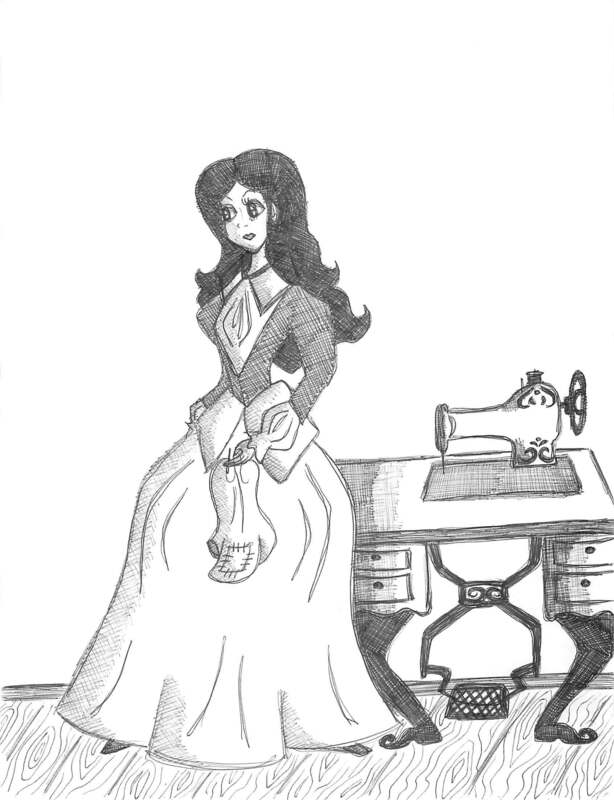 The seamstress happily accepted, but she knew that she would need to ask for her grandmother’s permission. She wasn’t surprised to hear her grandmother’s words of caution. She had heard them her whole life. The grandmother gave in and approved of the engagement, but did so apprehensively. She had already lost her daughter and she couldn’t bear to lose her granddaughter too. And so the young seamstress asked the fisherman to stay, to give up the ocean, the adventure, and the danger, and to stay with her on dry land. He agreed, and with the grandmother’s confidence restored, preparations for the wedding began. The fisherman struggled with his new life away from the sea, but he believed he had chosen what was best for his soon to be wife. It was not easy, though, to turn his ear when he heard the sea calling to him, so he turned to other distractions—his vices, drinking and gambling. Three nights before the wedding, he kissed his fiancée on the cheek and walked to the tavern. He promised himself only a drink or two, but his friends invited him to a game of cards, and he couldn’t resist. He won the game through blurred eyes and stumbled out of the tavern. The building sat right on the shore and he took the few steps down to the beach. He was busy wading through the water when a voice called from behind him. “I want my money back,” said the captain of a rival fishing boat. The boat had taken massive damage during the last big storm and needed more repairs than the captain could afford. He had turned to drinking and let the hulk of the boat rust away. “But I won it fair, sir,” the fisherman said and turned around. “I don’t believe you. I think you cheated me. I think you’ve lost all your manhood and you thought stealing from me would make you feel better.” He grew angrier. “No, I thought beating you would make me feel better.” The young fisherman’s laughter only worsened the old captain’s anger. “A good man, sir,” he answered with a tip of his hat. The fight broke out then, with wobbling fists and drunken slurs. The younger man fought his best and would have won, had the old captain not pulled the gun from his coat and shot him in the chest. The young man stumbled, calling out his lover’s name, and fell back onto the wet sand. The old captain ran away as the crowd from the tavern hurried outside to see what the commotion had been. “Bring the seamstress, bring the seamstress,” they yelled. She was pulled from her bed and told to grab her tools. “What color patch?” The seamstress asked in a panic. But there was no time for her to choose. The crowd parted and held its breath. She placed the patch over the wound and began sewing it over his chest. But quicker than her fingers worked, the blood seeped through the cloth, until it was so soaked that she could no longer see the thread. The seamstress stood up, her hands covered in blood and her dress soaked in saltwater and sand, and ran home. She called to her grandmother. Her grandmother appeared from her bedroom and the young girl told her everything. The granddaughter wiped her salty tears with the backs of her hands and buried her face in her grandmother’s dress. “Fix his heart, fix his heart,” she demanded. They buried the fisherman the next day, not at the bottom of the ocean like so many men who had been lost at sea, but on dry land, in the ground—less romantic, but still as final. The seamstress shut herself up in the sewing room with the pretense of wanting to take apart her wedding dress so she could use the fabric to create something new, something that could have a chance at happiness, like a blanket for a newborn. Once her grandmother’s footsteps could be heard walking down the path to the market, she picked up the first square of white cloth. She let a pool of saliva collect in her mouth to make the swallowing easier. She placed it in her mouth and went to work moistening it and consuming it little by little, with the precision of a sword swallower. She coughed on the second piece and choked a little on the third, but she couldn’t stop. You couldn’t patch up a heart from the outside; it turned out you had to go about it from the inside. The fabric filled up her body like lungs filling with saltwater. Thank you, Alisha, for the illustrations. your welcome, it looks good!